Celebrating Diwali—the Festival of Light | Where to next? We’ve just seen this month’s full moon and it dawned on me that I hadn’t yet written about our Diwali celebrations, which happened two weeks ago on the new moon. Popularly known as the Festival of Lights, Diwali (formally known as Deepavali) is celebrated by Hindus, Sikhs and Jains throughout the world. Many countries declare Diwali an official holiday. It is India’s most important holiday and, in past years, we’ve seen it widely celebrated in places such as Singapore and Burma (Myanmar). In most parts of India, Diwali coincides with the end of the harvest season. As winter approaches here, it is a time for farmers to give thanks for a good crop and pray for a bountiful year ahead. Some businesses start their new financial year on the first day of Diwali celebrations. For the most part, people celebrate Diwali with family. They pray to Lakshmi, goddess of wealth, light, prosperity and wisdom, and to Lord Ganesha, the ‘remover of obstacles’ and ‘lord of beginnings’. 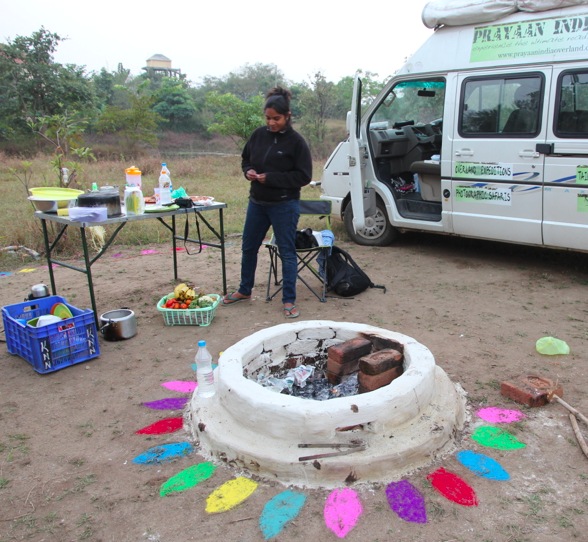 Before we even arrived in India, Deepti wrote to say our little overland ‘family’ would be marking the occasion with a simple celebration in a campground, but with decorations, fireworks and new outfits. Renae was especially thrilled by the mention of fireworks. Quite a few years back, the place where we live in Australia banned ‘cracker night’, meaning no fireworks in the backyard. Of course, for us to prepare for the festivities in style called for a couple of special shopping expeditions, including one to stock the van. Whether you are rich or poor, two days before Diwali is everyone’s chance to go on a shopping spree. The shopping is compulsory. There’s even a name—Dhanteras—for the day. Silver and gold are the most popular purchases on Dhanteras, but we stuck to the 3Fs—food, fireworks and fashion. My Diwali outfit failed the 3Fs policy I have for clothes. It did Fit (sort of), but it did not Flatter and it certainly was not Fashionable. Renae’s get-up was better, but Gary, Poor John and Anand did quite well. Gary even struck a pose. Deepti ‘cheated’ and wore an outfit she already owned. 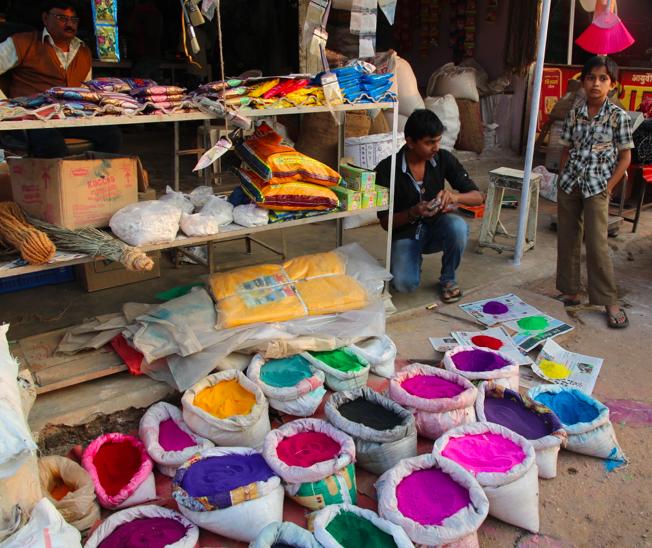 We saved some of our Diwali requirements so we could make purchases on the roadside and the local market near our campground. We bought a woven bamboo decoration, an array of powdered chalk for making patterns on the ground, small clay candle dishes, a selection of fresh veggies and a couple of live chooks (Aussie slang for chickens). This would be the first of many times that we would buy our protein live—the best answer when refrigeration is limited or non-existent. 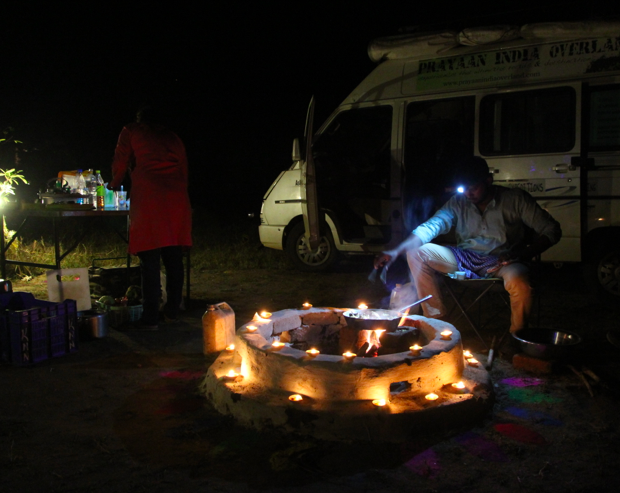 After a couple of safari drives in Pench National Park, it was back to camp for a simple and memorable Diwali event. If you want to know more about Diwali, check out this interesting and informative blog post I found. Oh Peggy, I can’t see the phot of you in which you claim to be wearing an outfit that didn’t flatter and wasn’t fashionable. How do you know? It seems to me, and I’m by no means ann expert, that you’re not sufficiently objective to make such an assessment. Only my opinion of course. I was pleased to see the post on Divali, the only one of your activities thus far with which I can claim some familiarity. My physiotherapist is Indian Australian and tells me what they get up to each year. I’m glad that you had such fun but still waiting for a photo of yourself!! Wow …you are having so many great experiences. I’m always looking forward to seeing where you are going next. Keep on enjoying! Thanks. I look forward to your posts too. Always such wonderful views. Given that it was dark that’s all the more reason for posting a photo. After all, we’re not always the best judges of what we look like; says she who never allows anyone, anytime, anywhere to take a photo of herself! But that’s me. It’s different for you because, unlike me, you look good in photos. More seriously, still absolutely delighted that you and John are having such a great time. Please say ‘hello’ to him for me. No amount of arm-twisting is going to get me to post that photo. 🙂 And Poor John says hi in return. This is too damn cool. Whimsy and mystical. Truly inspirational. Thanks. We felt so lucky to be part of it. I’m just getting going on the blog. Internet connections have been so bad that it’s been impossible to post. That said, we have been is some pretty remote places. Sorry to be so quiet for so long. Internet has been abysmal. We’ve been having a wonderful time. More posts coming soon. Two weddings and a funeral | Where to next? Happy Diwali—festival of lights | Where to next?